Striving Green: I Want This! We're slowwwwly redoing our kitchen. Little by little. Did I mention we're redoing our kitchen very slowly? I recently got a chance to see a model kitchen at our State Fair that had cork flooring installed. It was sooo wonderfully cushy. 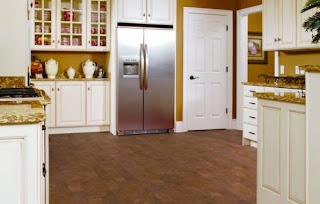 What great flooring to have in the kitchen since we spend so much time there. We have an eat-in kitchen. No dining room. LOTS of time spent there. Cork flooring is environmentally friendly (cork is harvested from the outside of trees which continue to grow when harvested correctly). It's warm and sound deadening too. Our kitchen gets so cold in the dead of winter. I can't help but think this is a great alternative to my desire to have heated flooring. See Natural Built Home and Duro Design. I'm sold. We got a floor that is cheaper than cork which is made from wool pulp and linseed oil. I think it's called Marmoleum? It's like linoleum or vinyl, but it's made from natural components and doesn't off-gas into your home. And did I mention that it's pretty cheap to buy? I hope you post photos of your kitchen progress. We just had ours remodeled last year when I was in the hospital. We installed cork in our bathroom and absolutely love it. The only thing is you have to be careful with it around water. In hindsite, not the best choice for a bathroom, and I wonder if you would have trouble with that in the kitchen, too. The issue is with water left on the cork - it lifts and buckles. This happened to a good friend and they had to replace their newly laid beautiful cork flooring. but, you are right, it is beautiful - I want to use it in our bedrooms. We have a bunch of home and remodeling businesses on our site - www.sprout.mn if you are looking for local places to remodel your kitchen with affordability and the environment being central to their business. Nice post.